Today – Lots of Thotakura, some Kale, Green Onions, Beet Root, Swiss Chard, Snow Peas, and small amounts of gongura, lettuce, spinach. 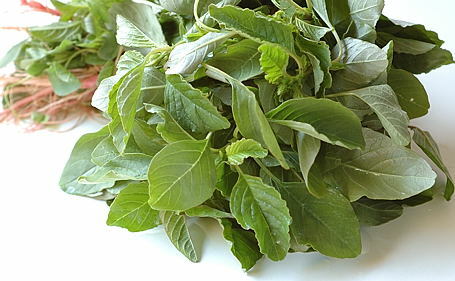 Basil, Sage, Thyme, Mint, Lemon Balm, and Oregano. Planted 5 flats of fenugreek in the greenhouse. Will be ready in a few days. Am in need of more fenugreek seed and cilantro seed if anyone can maybe get me a few lbs or so. Let me know the cost. Soon – Egg plant, Okra, and Hot Peppers. Eggs – 2 dozen non organic and 1 dozen from organic feed chickens. Still have 10 young layers for sale for eating. If you want to get on the list for this fall, for some of these young organic feed layer chickens, please let me know. I have placed an order for 30 of them. We will get them about August 23 and they should be ready to butcher in October and November. Horseback Trail Rides and Pony Rides for all ages. Visit our country store. Candles made by Tonia, NCF shirts, and home decor.